Source of Support: This project supported by Knowledge Utilization Research Center, project number is 20130-102-03-91. Tehran University of Medical Sciences., Conflict of Interest: None declared. Results: The results showed that items such as "The nurse is isolated from knowledgeable colleagues with whom to discuss the research," "There is insufficient time on the job to implement new ideas," "The nurse does not have time to read research," "The nurse does not feel she/he has enough authority to change patient care procedures," "The facilities are inadequate for implementation," "Physicians will not cooperate with implementation," and "The relevant literature is not compiled in one place" were rated as the main barriers. Scientific search that either refines the current knowledge or results in new information is regarded as the main component of nursing practice. However, the process of incorporating good-quality research findings into nursing practice is not straightforward. This drawback resulted in initiation of term of evidence-based nursing into the world of professional nursing care during research development. Evidence-based practice is a problem-solving approach that integrates the best evidences from studies with clinician expertise and patient preferences to provide the best care for individual patient. The results of several studies indicated that application of research findings improves clinical outcomes,,, and nurses as the main members of the professional health team should be able to provide best quality care to patients according to the evidences that originated from studies and patient preferences. However, the resuls of studies indicated that application of research findings is not widely implemented in the routine practice of nurses. Nurses still provide nursing care mostly based on what they have learned in their baseline education and also on their personal experiences aquired in clinical settings. In the study of Hutchinson and Johnston, the main barriers included: Time constraints, lack of knowledge, limitation of access to research literature, lack of clinical authority, inadequate skills in critical evaluation of research papers, and lack of professional support. Interestingly, having sufficient time for review and application of research findings, access to relevant research reports, and peer support were listed as the main facilitators. A study by French showed that overtaking all four stages of researches identification, findings verification, results evaluation, and application to the clinical setting is critical for nurses in order to import the research results in the clinical activities. The results of the systematic review of Kajermo and colleagues in 2010 showed that from 1991 to 2009, nearly 70 studies have used this scale from different geographic regions in the United States and Europe. They also showed that lack of time, knowledge, and skill to appraise the quality of research and professional support from other heathcare providers and managers were the prominent barriers for utilization of research findings. The aim of this systematic review was to determine the main barriers and facilitators of employment of new research results by Iranian nurses in health care and to organize these findings to conclude about further researches in this field. The published reports were searched in international electronic databases including PubMed, Web of Sciences, Cumulative Index to Nursing and Allied Health Literature (CINAHL), Scopus, Ebsco, EMBASE, and Science Direct up to 2013 using the search terms including Research Utiliz*, Research Utilis*, use of research findings, research impliment*, barrier research, research barrier, AND nurs* AND Iran, I. R. Iran, Iranian, Iranians. Also, these keywords were searched on national electronic databases including Scientific Information Database (SID), IranMedex, and Medical Articles Library (Medlib) using the same strategy. In addition, the gray literature such as reports, dissertation, and conference abstracts was searched from library catalogue, professional websites, and government and private sectors. Following collection of papers, the records containing thesis and articles were extracted into the EndNote software. All studies investigating the barriers and facilitators of research utilization were included in this review. The inclusion criteria were set as: qualitative studies, quantitative studies that used original or modified BARRIERS scale (or) any other scales, all types of clinical nurse papers regardless of role (staff nurse, specialist, administrator) and setting (acute care, long-term care), and articles related to faculty and nurse educators. Our search was limited to articles in Farsi and English. No restriction on the basis of study design was considered. In the original search, 21 articles were obtained. One member of the team performed primary screening to assess the list of articles. In this initial assessment, seven duplicate articles were removed. 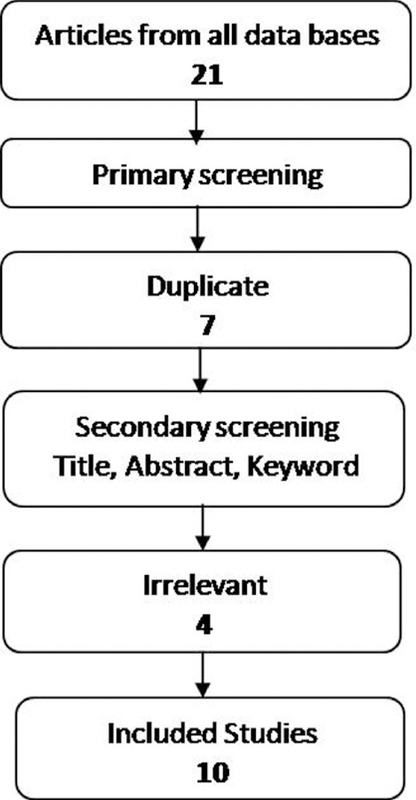 In the second screening, title, abstract, and keywords were assessed and 4 more irrelevant articles were excluded, which left us with 10 final articles [Figure 1]. The included studies [Table 1] were assessed for methodological strength using two quality appraisal tools: the STROBE statement for cross-sectional studies and an appraisal tool for qualitative papers. 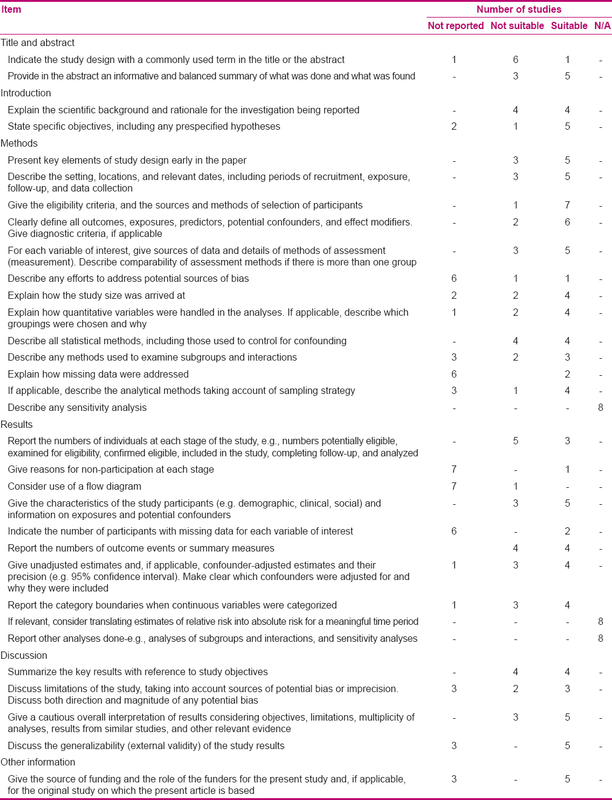 The STROBE statement tool for cross-sectional studies included 32 questions [Table 2]. The tool for qualitative studies included 12 questions [Table 3]. In both tools, each question was scored with 2 if the stated criterion for the question was presented in a suitable form, with 1 if the stated criterion for the question was presented but did not meet the standard, and with 0 if the stated criterion was not presented. Also, there was no alternative for the standards. In the STROBE statement tool, three questions, which were not applicable, were removed from the total score. These questions were: "Describe any sensitivity analyses," "If relevant, consider translating estimates of relative risk into absolute risk for a meaningful time period," and "Report other analyses done, e.g. analyses of subgroups and interactions, and sensitivity analyses." All included articles were then examined with modified STROBE statement tool that contained 29 questions. Each article could receive a score between zero and 58. Articles that gained score between 58 and 42 were recognized as strong-quality articles, articles with score between 41 and 26 were categorized as having moderate quality, and articles with score below 16 were considered weak-quality articles. Two researchers separately gave scores to the articles. Mean score was calculated in case differences were reported between the two rated scores. The research team developed a protocol to obtain information about demographic variables, year of publication, setting, location, methodology, sampling techniques, sample size, questionnaire, and subscales and items. To authorize the protocol, the datasheet was prepared, and all the authors assessed two articles and then independently extracted the information into the datasheet. A consensus was reached on how to apply the protocol and to extract data into the datasheet. For data extraction, two authors read all the articles and disagreements were resolved by consensus. Descriptive statistics including frequencies, mean score, and standard deviation was considered to report the barrier items and rank order. Intellectual property rights were considered for all the authors. All articles obtained from the search were reviewed in primary screening. They were not included in the study if they did not comply with the inclusion criteria. The researchers did not interfere in the process of article selection. The characteristics of 10 studies included in this review are presented in [Table 1].,,,,,,,,, The selected studies were conducted from 2001 to 2012. The first study was conducted in 2001, and other studies followed with a 6-year gap and were conducted from 2007 to 2012. According to the results of quality evaluation, no article was verified as weak, five articles were recognized as moderate, and five articles were identified as strong studies. Two studies used qualitative design of grounded theory and content analysis and the eight remaining studies used descriptive cross-sectional design [Table 1]. In quantitative studies, the sample size ranged from 70 to 770, with only one study reporting a sample of more than 500. The number of participants in qualitative studies was 15 and 21. The samples contained of nurses with various role titles (clinical nurse, nurse specialist, staff nurses), working in various specialties and settings. In one qualitative study, the samples consisted of nurse managers and nurse educators [Table 1]. Except for one article that covered all provinces of Iran, other studies were done in one location. The reliability and validity of questionnaires is reported in [Table 4]. Of the eight cross-sectional studies, three articles did not report Cronbach's alpha. In the rest of the studies, Cronbach's alpha ranged from 0.71 to 0.93. As it is shown in [Table 5], six studies used modified BARRIERS scale. Some items such as "The nurse is isolated from knowledgeable colleagues with whom to discuss the research," "There is insufficient time on the job to implement new ideas," "The nurse does not have time to read research," "The nurse does not feel she/he has enough authority to change patient care procedures," "The facilities are inadequate for implementation," "Physicians will not cooperate with implementation," and "The relevant literature is not compiled in one place" were rated as main barriers. More than 50% of Iranian nurses scored these items as moderate to great barriers, and these items appeared among the top 10 barriers. 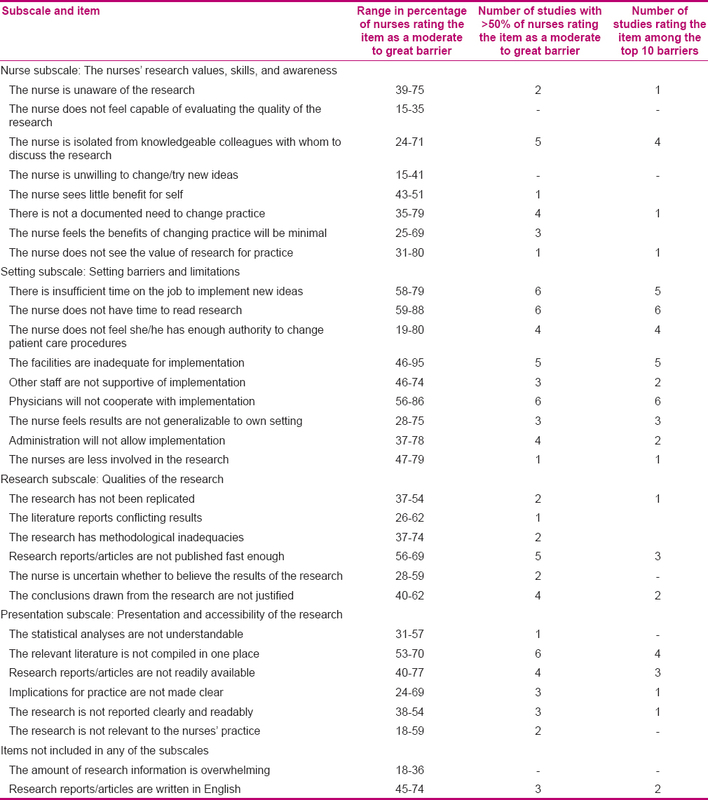 Precise review of [Table 5] shows that majority of the questions in the subscale "setting barriers and limitations" were rated as moderate to great barriers and were placed among the top 10 barriers. In Iranian nurses' view, "There is insufficient time on the job to implement new ideas," "The nurse does not have time to read research," and "Physicians will not cooperate with implementation" were the main barriers in a clinical setting. On the other hand, lower response rate was obtained for "nurses' research values, skills, and knowledge" items. In this subscale, the nurses just paid attention to the item "The nurse is isolated from knowledgeable colleagues with whom to discuss the research" and rated it in four articles as among the top 10 barriers [Table 5]. Outcome and rank order of barriers and facilitators are provided in [Table 6]. It is interesting to note that even though the studies were performed in a period of 11 years and in different geographic locations, no change in the type of mentioned facilitators and barriers was noticable. In the first study, "inadequate facilities for implementation" was stated as the main barrier, and there is consensus in the outcomes of other studies about "lack of time and facilities" as the main barrier. These findings appear while obtaining categories and themes from qualitative investigations [Table 6]. Although all studies focused mostly on the barriers of research employment, in some studies, items such as "the role of in-service training and education in enhancing the nurses' knowledge and skills of research evaluation," "human resources," "individual/organizational factors," and "equipping hospital library with a variety of journals and internet access" were noted as principal facilitators [Table 6]. Results of our systematic review showed that the barriers and facilitators of implementation of new research findings in practical nursing care remained constant over time and across different locations. "Lack of time and facilities" was stated by Iranian nurses as the main barrier, a finding that was similar to what was reported by Kajermo and Carlson and Plonczynski. On the other hand, the main facilitator was having adequate human resources and also proper in-service training to empower nurses to obtain research skills. Although Hutchinson and Johnston found that among their study subjects, sufficient time for review and application of research findings were the main barriers andaccess to relevant research reports and peer support were the main facilitators in their study. Our results showed that of the top 10 barriers in Funk BARRIERS scale, 7 factors have been jointly agreed in a majority of studies. It is necessary to notice that the cross-sectional design cannot provide a comprehensive understanding of some concepts such as time or equipment. For example, the concept of time as a major obstacle is a multifaceted concept, so Thompson et al. reported in their study that "enough time" and "lack of time" could be a mental affair. Also, Kajermo stated that "inadequate facilities" is not a comprehensible barrier because this concept could refer to material or human resources. There were no differences between the findings of moderate and strong studies; however, methodological flaws should be considered. One of the limitations of the included articles is the level of evidence of the articles. All studies in this field had a descriptive approach, a kind of approach that cannot provide strong evidences for policy makers' decision-making. Carlson and Plonczynski noted that it is not necessary to conduct more descriptive studies about barriers to research utilization, but it is time to deal with the association of nurses' perceptions of obstacles and applications. However, we should mention that none of the included studies assessed this association. Tyden emphasized that performing longitudinal studies could provide further evidence of barriers to research utilization. Kajermo's findings in a systematic review revealed that such studies could provide valuable information for policy makers. Our results showed that only one study used BARRIERS scale to assess critical care unit, but this scale is regarded as a general scale and cannot determine specific barriers to the application of research findings based on different sections. A study conducted by the Cochran systematic review team and aimed to examine the barriers of research utilization showed that clinical uncertainty, lack of competency, sense of responsibility, patient expectations, performance standards, and financial and administrative constraints were the main factors of application of findings in specific clinical settings. Mehrdad and colleagues reported the elements of Iranian model of research utilization, which included compliance, planning and preparation, adoption and internalization to research findings; however, none of Iranian studies used or tried to improve this model. In this model, acceptance of research findings is the starting point of this process, and followed by several stations on its route. Unfortunately, in the investigations performed in Iran, less attention has been given to this model. The results of 10 studies about research utilization in Iran showed that the barriers and facilitators remained constant through time and across different locations. "Time" and "insufficient facilities" were the main barriers that appeared in most of the reviewed studies. Also, the rank order of barriers and facilitators was the same approximately through different settings. To our knowledge, this is the first systematic review that covers the issue of research utilization in the population of Iranian nurses, which we could signal as one of the strengh points of this study. However, our study has been faced with some limitations. The articles having low quality were not included in our methodological design. Also, due to some database access limitation, we needed to contact some of the authors, which, in some cases, inhibited us from accessing full articles. Moreover, the process of data extraction evaluation might have produced some degree of bias which should be considered when interpreting the results. Nurse managers and administrators at all levels from policy making to scheduling are in a key position to apply the findings of this review to allocate human and other resources in order to promote the research utilization in a clinical setting. Also, these findings assist the nurses to comprehend how they can overcome this obstacle and provide the patient care according to the best evidence. The main point raised by this review is the necessity of assessing research utilization barriers in specific clinical settings in order to capture the background and the particular characteristics of evidences. Despite variations in geographic study settings and the assessed quality, the Iranian studies did not address any local relevant barriers to research utilization. Therefore, we recommend that no further descriptive study with or without BARRIERS scale should be undertaken. Instead, prospective studies with high level of evidence in various clinical settings such as ICU, emergency, and other clinical ward should be undertaken in order to assess different instrumental and human factors in spesific settings. This review was funded by the Knowledge Utilization Research Center of Tehran University of Medical Sciences. The author acknowledges all nurses who collaborated with this review. Forsman H, Gustavsson P, Ehrenberg A, Rudman A, Wallin L. Research use in clinical practice-extent and patterns among nurses one and three years postgraduation. J Adv Nurs 2009;65:1195-206. Forsman H, Wallin L, Gustavsson P, Rudman A. Nursing students' intentions to use research as a predictor of use one year post graduation: A prospective study. Int J Nurs Stud 2012;49:1155-64. Heiwe S, Kajermo KN, Tyni-Lenné R, Guidetti S, Samuelsson M, Andersson IL, et al. Evidence-based practice: Attitudes, knowledge and behaviour among allied health care professionals. Int J Qual Health Care 2011;23:198-209. Michel Y, Sneed NV. Dissemination and use of research findings in nursing practice. J Prof Nurs 1995;11:306-11. Newell R. Research and its relationship to nurse education: Focus and capacity. Nurse Educ Today 2002;22:278-84. Wallin L, Boström AM, Wikblad K, Ewald U. Sustainability in changing clinical practice promotes evidence - based nursing care. J Adv Nurs 2003;41:509-18. Thompson C, McCaughan D, Cullum N, Sheldon T, Raynor P. Barriers to evidence-based practice in primary care nursing – why viewing decision-making as context is helpful. J Adv Nurs 2005;52:432-44. Stevens KR. Systematic reviews: The heart of evidence-based practice. AACN Clin Issues 2001;12:529-38. Newhouse R, Dearholt S, Poe S, Pugh LC, White KM. Evidence-based practice: A practical approach to implementation. J Nurs Adm 2005;35:35-40. McClurkin SL, Bailey L, Kwan M. Nursing Journal Club: Bridging the gap between practice and research. J Peri Anesth Nurs 2011;26:192. Adamsen L, Larsen K, Bjerregaard L, Madsen JK. Danish research-active clinical nurses overcome barriers in research utilization. Scand J Caring Sci 2003;17:57-65. Estabrooks CA, Winther C, Derksen L. Mapping the field: A bibliometric analysis of the research utilization literature in nursing. Nurs Res 2004;53:293-303. Milner FM, Estabrooks CA, Humphrey C. Clinical nurse educators as agents for change: Increasing research utilization. Int J Nurs Stud 2005;42:899-914. Cranley L, Doran DM, Tourangeau AE, Kushniruk A, Nagle L. Nurses' uncertainty in decision-making: A literature review. Worldview Evid Based Nurs 2009;6:3-15. Radjenovic D, Chally PS. Research utilization by undergraduate students. Nurse Educ 1998;23:26-9. Wallin L, Gustavsson P, Ehrenberg A, Rudman A. A modest start, but a steady rise in research use: A longitudinal study of nurses during the first five years in professional life. Implement Sci 2012;7:19. Retsas A, Nolan M. Barriers to nurses' use of research: An Australian hospital study. Int J Nurs Stud 1999;36:335-43. Nilsson Kajermo K, Nordström G, Krusebrant A, Björvell H. Barriers to and facilitators of research utilization, as perceived by a group of registered nurses in Sweden. J Adv Nurs 1998;27:798-807. Funk SG, Champagne MT, Wiese RA, Tornquist EM. Barriers to using research findings in practice: The clinician's perspective. Appl Nurs Res 1991;4:90-5. Hutchinson AM, Johnston L. Bridging the divide: A survey of nurses' opinions regarding barriers to, and facilitators of, research utilization in the practice setting. J Clin Nurs 2004;13:304-15. French B. Contextual factors influencing research use in nursing. Worldviews Evid Based Nurs 2005;2:172-83. Kajermo KN, Boström AM, Thompson DS, Hutchinson AM, Estabrooks CA, Wallin L. The BARRIERS scale -- the barriers to research utilization scale: A systematic review. Implement Sci 2010;5:32. Vali Zadeh L, Zaman Zadeh V, Fathi Azar A, Safaeian A. 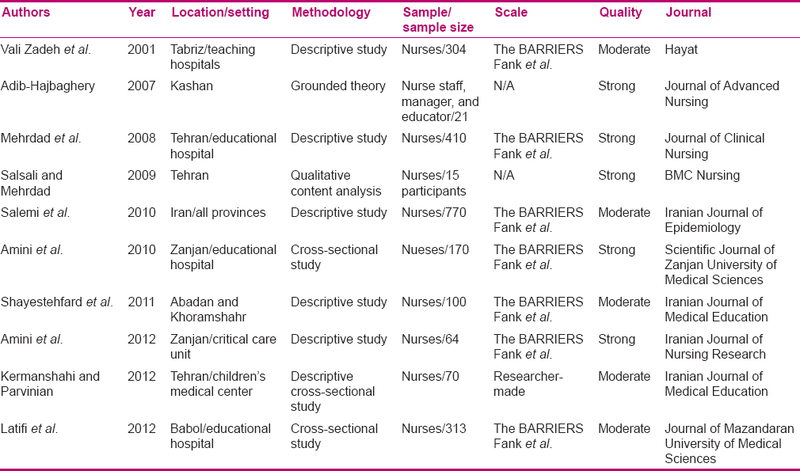 "Barriers and facilitators of research utilization among nurses working in teaching hospitals in Tabriz." Hayat 8, no. 2 (2002): 32-42. Salsali M, Mehrdad N. Iranian nurses' constraint for research utilization. BMC Nurs 2009;8:11. Mehrdad N, Salsali M, Kazemnejad A. Iranian nurses' attitudes toward research utilisation. J Res Nurs 2008;13:53-65. Mehrdad N, Salsali M, Kazemnejad A. 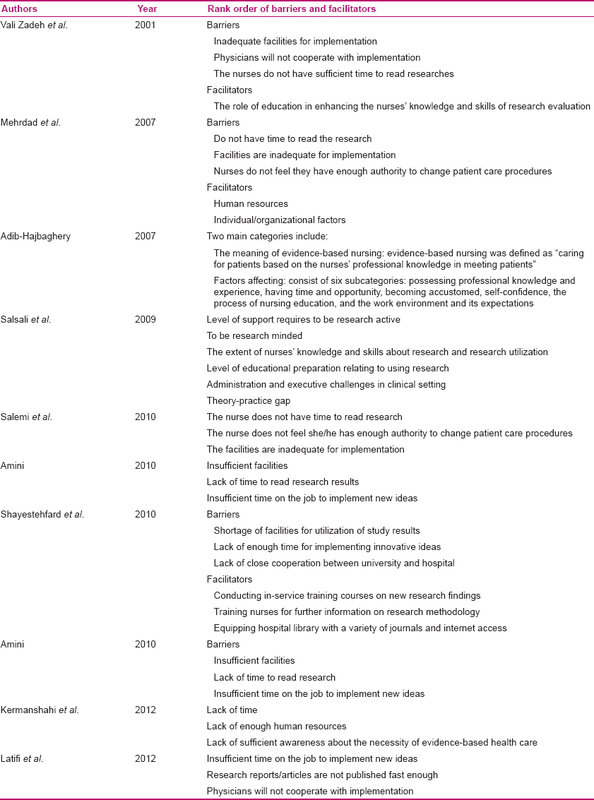 The spectrum of barriers to and facilitators of research utilization in Iranian nursing. J Clin Nurs 2008;17:2194-202. Salemi, Identify of barriers to research utilization in the nursing clinical practice, in Iran. Iran J Epidemiol 2010;6:1-9. Kermanshahi S, Parvinian AM. Barriers to Implementation of Evidence-Based Care: Viewpoints of Nursing Staff. Iran J Med Educ 2012;12:84-92.
von Elm E, Altman DG, Egger M, Pocock SJ, Gøtzsche PC, Vandenbroucke JP; STROBE Initiative. The Strengthening the Reporting of Observational Studies in Epidemiology (STROBE) statement: Guidelines for reporting observational studies. Prev Med 2007;45:247-51. Walsh D, Downe S. Appraising the quality of qualitative research. Midwifery 2006;22:108-19. Adib-Hajbaghery M. Factors facilitating and inhibiting evidence-based nursing in Iran. J Adv Nurs 2007;58:566-75. Latifi S, Khalilpour A, Rabiee OL, Amani N. Barriers to research utilization among clinical nurses. J Mazandaran Univ Med Sci 2012;22:87-95. Carlson CL, Plonczynski DJ. Has the BARRIERS Scale changed nursing practice? An integrative review. J Adv Nurs 2008;63:322-33. Thompson DS, O'Leary K, Jensen E, Scott-Findlay S, O'Brien-Pallas L, Estabrooks CA. The relationship between busyness and research utilization: It is about time. J Clin Nurs 2008;17:539-48. Tyden T. The contribution of longitudinal studies for understanding science communication and research utilization. Sci Commun 1996;18:29-48. Baker R, Camosso-Stefinovic J, Gillies C, Shaw EJ, Cheater F, Flottorp S, et al. Tailored interventions to overcome identified barriers to change: Effects on professional practice and health care outcomes. Cochrane Database Syst Rev 2010;17(3):CD005470.